Simply reading a research article doesn’t provide any insight into how a project progresses from inception to fruition/publication. Sometimes projects start as a good idea. Other times they begin from interesting or unexpected results. Every so often, it is an accident. A project that I started four years ago at the beginning of graduate school was finally published last week. It was by far my favorite project. Not only because of the content but also because of the journey. In response to a question posed by masterm on the chemistry subreddit, I am going to share my experience with the process between inception and publication for this project and hopefully provide some insight for the uninitiated. My graduate career can be broken down into two categories: 1) research that pays the bills and 2) purely scientific research. 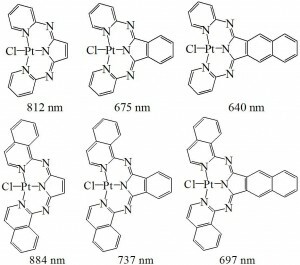 In 2005 when I started graduate school my adviser, Mark Thompson, came to me with a not so simple request: “Find a molecule that exhibits efficient (>10%: more than 10 out of every 100 photons that are absorbed are then emitted) phosphorescence between 750 and 900 nm.” This project fell into category 1 because it had specific, short-term, grant dictated goals along with a long term goal of producing a commercially viable product. Unfortunately/fortunately the number of published molecules that efficiently phosphoresce in that wavelength range is limited. During the years that followed my colleges and I (team IR) became entrenched in the idea of taking known molecules and extending the π-conjugation to red-shift emission. 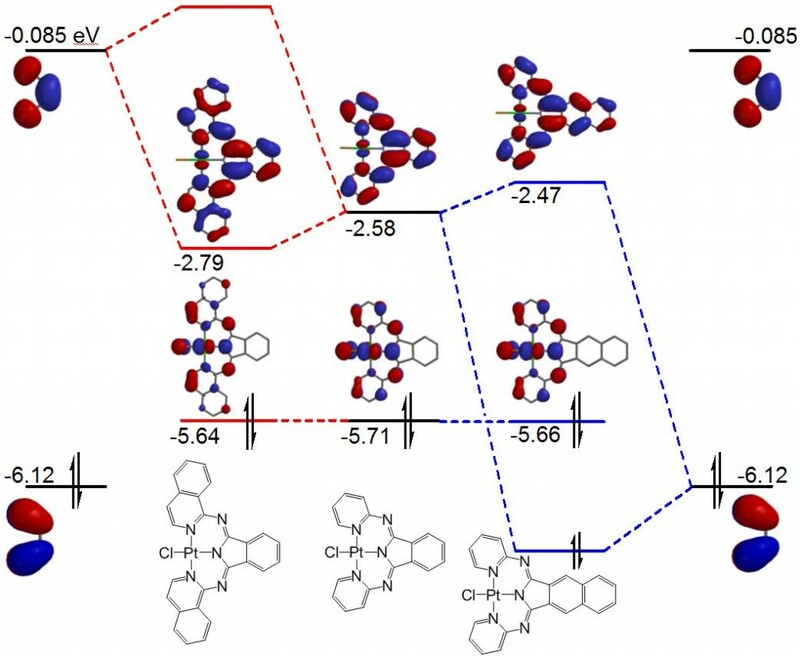 This strategy was based on a common tenet in small molecule photophysics that says if you extend the π-conjugation of a molecule (add more benzene rings) you will lower the energy of absorption/emission (changing from blue/high energy/shorter wavelength towards red/low energy/longer wavelength). It is a ‘particle in the box’ mentality. That is, if you extend the box you will lower the energy of the system. The words “let’s just add some benzene rings to it” became our regular chorus. With this mantra we had a considerable amount of success, adding benzene rings (benzannulating) platinum porphyrins. Attempts at benzannulating other systems were less successful in that they either did not shift the emission or they were unstable. At the 2006 ACS meeting in San Francisco I presented my results on one of these “failed” pursuits. I also made an effort to go to as many talks and poster secessions as possible hoping that I would come across a new molecule/ligand that might help reach our goal. I kept seeing 1,3-bispyridylisoindole (BPI) ligand in various catalysis presentations. 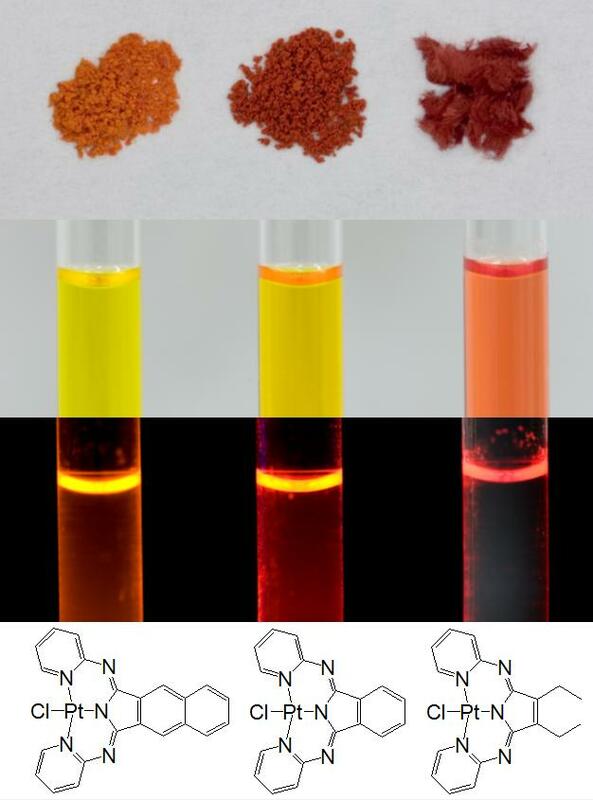 It caught my attention because it has many of the components that we have in our near-infrared emitters: a pyrrole like our iridium dipyrrins (λem = 672 nm) and platinum porphyrins (λem = 650 nm), an isoindole like platinum tetrabenzoporphyrins (λem = 765 nm) and phthalocyanines (λem = ~1000 nm). It is a simple concept in chemistry that, more often than not, if things look similar they will exhibit similar behaviors. Before we ever go to the bench and synthesize a new molecule we first perform a DFT calculation to get an estimate of its phosphorescence wavelength (Etriplet-Esinglet or EHSOMO(triplet) – EHOMO(singlet)). In my hotel room that night I performed this high yield “reaction” (Titan: B3LYP, LACVP**) and inserted a platinum chloride into BPI and found the calculated emission wavelength was 675 nm. That is way out into the deep red but not quite to the 750-900 nm we were looking for. So what’s next? 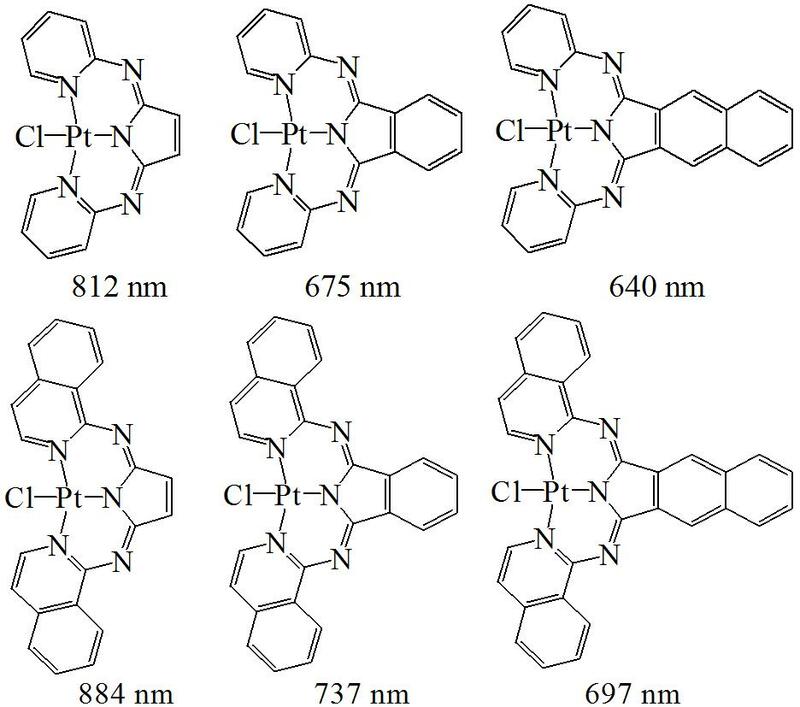 The chorus comes around again: “BENZANNULATE!” Adding three benzene rings (bottom right) to the parent structure (top middle) resulted in a modest red-shift in the emission wavelength from 675 nm to 697 nm. Needless to say, this was an anticlimactic result. I was disappointed and wanted to understand why there was only a small shift, so I calculated a series of these molecules (above). A clear trend can be observed, benzannulating the pyrrole ring results in a blue shift, benzannulating the pyridyl ring results in a red shift. 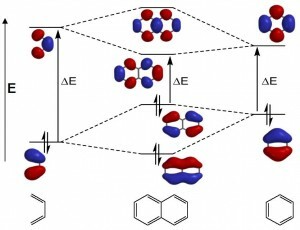 The calculated blue shift is counter to the common expectation that benzannulation results in red shifted absorption/emission. Between my advisers interest in the two molecules predicted to emit above 800 nm and his desire to find out if the calculations were correct, he gave me permission to pursue the project. Following published procedures or slightly modified versions of these reactions I was able to produce several similiar molecules. In both absorption and emission, the predicted trends were correct. In fact, even without taking a measurement it was obvious to the naked eye that the absorption and emission were blue shifting upon benzannulation of the pyrrole ring (left). So now that we knew that the phenomenon was real, the question was “Why the blue shift?” Turning to literature we were able to find several examples of molecules that exhibit this behavior but the explanations given were either incomplete or molecule specific. No generalized explanation could be found. So we had a mystery on our hands. Between our preliminary calculations, photophysical and electrochemical measurements we were able to conclude that an unchanging HOMO energy (similar oxidation potential) and a destabilized LUMO energy (increasing reduction potential) with each benzannulation was responsible for the observed trend. Reflecting on the question I experienced a flashback to constructing orbital diagrams in undergraduate chemistry classes. For the sake of people not to familiar with the topic, I will quickly review molecular orbitals. The interaction between two orbitals can be broken down into three categories: bonding, antibonding and nonbonding. 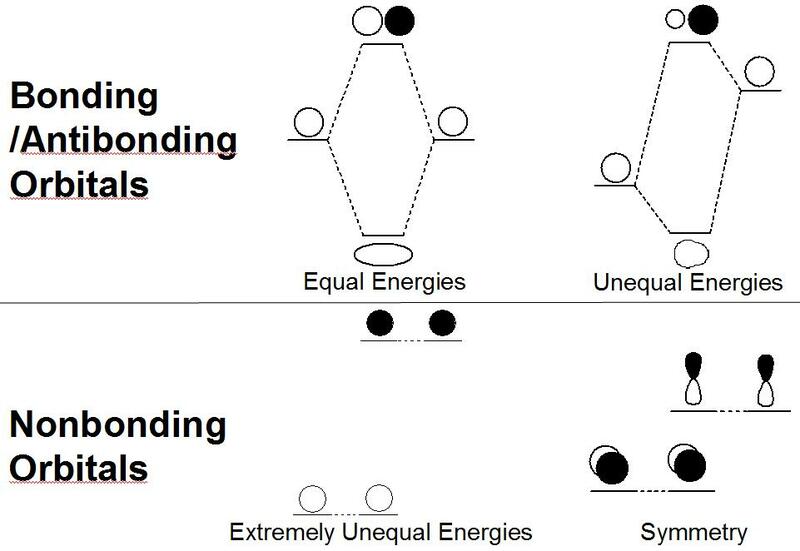 In cases where the energies and symmetries of two orbitals are similar they will interact to produce a stabilized bonding and a destabilized antibonding interaction. The shape and energy of these bonding/antibonding orbitals will be dependent on the energies of the two interacting orbitals. 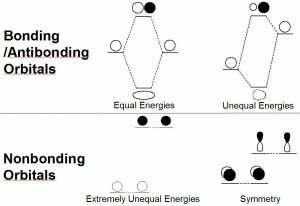 In cases where the orbital energies are extremely unequal no interaction will occur. Similarly, if the symmetry of two orbitals are not similar they will not interact (example: px and py are orthogonal and thus will never interact). Using thus basic principle to construct an orbital diagram of naphthalene from the combination of benzene and butadiene you will find that a HOMObezene-HOMObutadiene bonding/antibonding interaction destabilizes the HOMO (increases the energy) and a LUMObezene-LUMObutadiene bonding/antibonding interaction stabilizes the LUMO (decreases the energy), as shown below. The HOMO destabilization and LUMO stabilization inevitably leads to a red-shifted absorption (smaller ΔE for the HOMO to LUMO transition) of napthalene relative to benzene. This type of orbital interaction is the reason behind the common expectation that benzannulation will red-shift absorption/emission. Without an answer to the question (“Why does the LUMO go up?”) I presented these results again at the 2008 ACS meeting in New Orleans. At the meeting I had a chance to catch up with one of my closest friends and a fellow graduate from the St. Cloud State University’s chemistry department, Luke Roskop (St. Cloud State is a small university in Minnesota that you have probably never heard of unless you enjoy college hockey). It just so happens he was/currently is a graduate student at Iowa State under one of the world’s foremost theoretical chemists, Mark Gordon. After a conversation that night and permission from both of our advisers we decided we were going to combine our expertise and do our best to come up with an answer. Over the several months that followed and through a combination of time-dependent DFT calculations, photophysical measurements and a bunch of reading we were leaning towards an argument that involved orbital diagrams. However, it was not until holiday break while both of us were back in Minnesota at Luke’s parent’s dinning room table that we had a break through. As a synthetic chemist, I often pigeon-hole myself into only thinking about molecules that can be made. In fact, I sometimes get an uncomfortable feeling when looking at a molecule that “feels” unstable. One of the things that I love about theoreticians is that if it can be dreamed of they can calculate it. Luke’s ability to imagine the “impossible” became infinity useful on that particular day. Utilizing his remote access to Iowa States computing cluster, Luke just started making changes to the BPI motif to figure out the effects of structural changes on the HOMO/LUMO orbitals and energies. After looking at dozens of molecules a tremendous feeling of clarity hit me. It was one of those rare moments that all scientists search for. My internal conflict floated away and for a brief moment I felt as if the universe made sense. I turned to Luke and said “You are going to love this!” What followed was my tentative explanation of the phenomena and then a long discussion between us to iron out the details. By the end of the night we had outlined what as of last week became our publication. Ignoring the importance of justifying the use of molecular orbitals (beyond the scope of this summary but is discussed in the paper) our rationalization can be reduced down to a simple molecular orbital argument. In the orbital diagram for benzene we find that a LUMO-LUMO interaction leads to destabilization of the LUMO of naphthalene as compared to benzene. 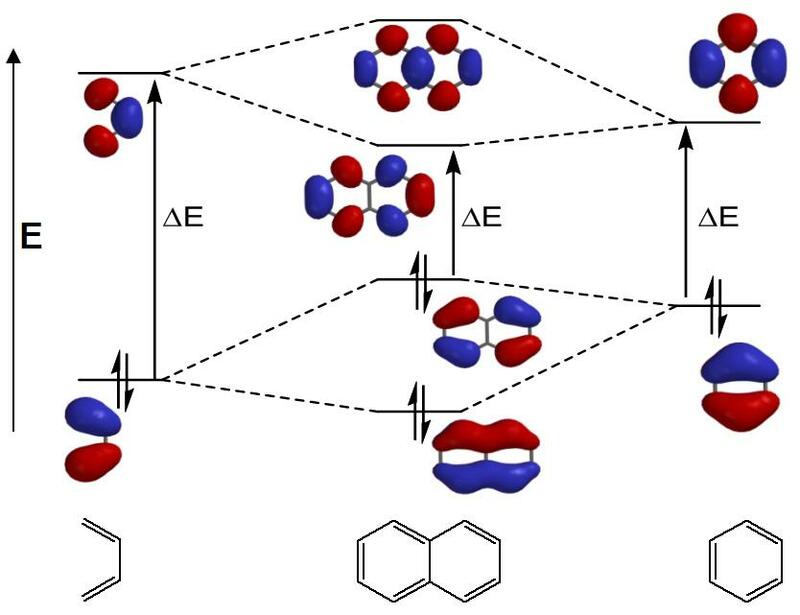 In the system described here, the HOMO of (BPI)PtCl (middle) has very little orbital density at the sites of butadiene addition and as a result no mixing occurs and the HOMO energy/orbital remains unchanged. The LUMO however, is energetically similar to both the HOMO and the LUMO of butadiene thus the type of interaction that occurs is dictated by the symmetry of butadiene addition. The nodal plane of the LUMO at the end of the isoindole ring of (BPI)PtCl is the same symmetry as the HOMO of butadiene (also has a nodal plane) and thus a bonding/antibonding interaction occurs that destabilizes the LUMO. The unchanged HOMO and the destabilized LUMO results in a blue-shifted absorption of the benzannulated product (right) relative to the parent molecule. Alternatively, the lack of a nodal plane on the pyridine ring at the sight of butadiene addition results in the expected LUMO-LUMO interaction resulting in a stabilized LUMO of the isoquinoline derivative (left) and red shifted absorption relative to the parent molecule. Similar arguments hold true for not only for benzannulating the other positions of (BPI)PtCl but also the previously published examples of blue-shifted absorption upon benzannulation. In short, we found an unexpected but straight forward visual manifestation of molecular orbital theory. We finished up the paper (an ordeal in itself), submitted it, and it was accepted after revisions. Go to presentations that are unrelated to your research/expertise. Pay attention to your unusual results. Gather knowledge. The more knowledge you have in a subject matter, the more likely you are to recognize something unusual. Find an adviser that will let you pursue an interesting project (I have no idea how to make this happen other than word of mouth or just get lucky). Don’t rule out the imaginary molecules. Sometime they are exactly what you need. Try not burn any bridges in pursuit of your goals; you might need help later.